One of my cats, Gabby, will sometimes make a coughing, wheezing sound, almost like he’s about to cough up a hairball or do the infamous scarf-and-barf move, but sometimes, nothing comes up! So, is cat wheezing something to worry about? And does cat wheezing always mean a trip to the vet? As any cat parent knows, cats make all sorts of weird sounds. Both of my cats do the scarf-and-barf every once in a while, meaning that sometimes they will eat their food too fast and throw it up immediately afterward. The cat wheezing sound is a distinct hack, hack, HACKING noise followed by my cats arching their backs, opening their jaws wide and puking. The results aren’t pretty and it sounds painful! Hacking up a hairball is a similar sound. I can hear that something is about to come up. But sometimes, when Gabby wheezes, it just sounds like he’s having the same coughing or sneezing fit that I get when I breathe in something I’m allergic to. These attacks usually last a few seconds to a minute and he makes distinct snorting / wheezing noises. Sometimes, he hunches his shoulders and strains his neck out as if to elongate his air pipes in an attempt to breathe better. 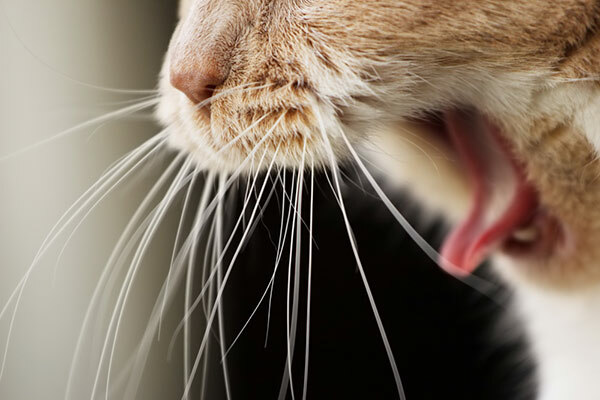 What is the difference between cat wheezing and coughing up a hairball? Does cat wheezing always mean a trip to the vet? 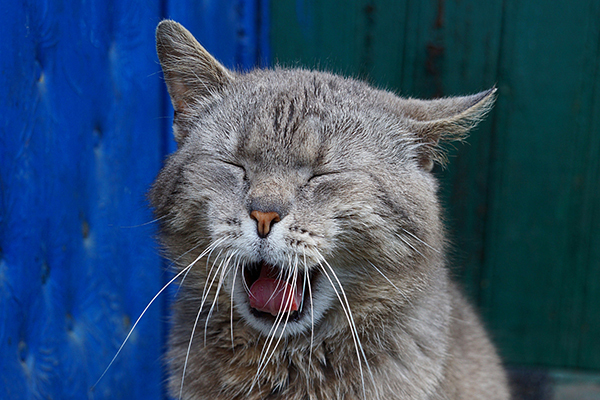 If you’ve ruled out hairballs, cat wheezing does warrant a trip to the vet. (And even some hairball situations mean a trip to the vet!). “It is very important to have your cat examined by a veterinarian to determine the cause of the wheezing,” Dr. Gibbons advises. 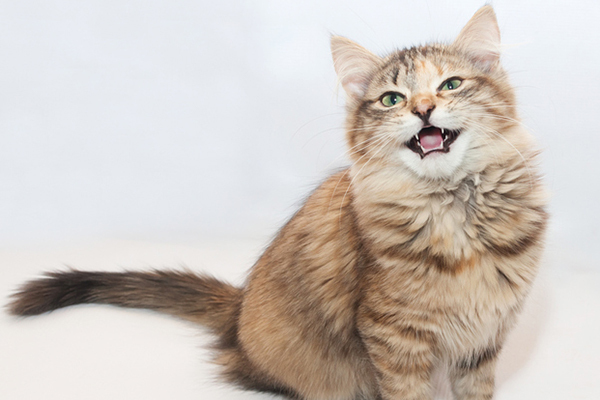 Is your cat wheezing, coughing up a hairball or in need of an emergency vet visit? Photography by Suzanne Tucker / Shutterstock. How do you treat cat wheezing? Treatments for cat wheezing depend on the cause. Kitties may be sent home with either short- or long-term treatments. And, just like human asthmatics, kitties who are wheezing because of asthma may get inhalers, too. 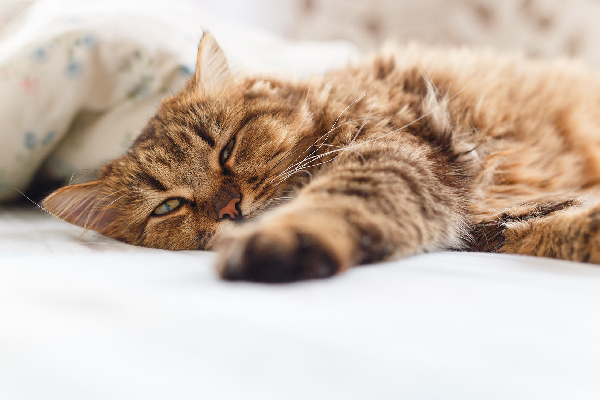 Can you prevent cat wheezing before it happens? 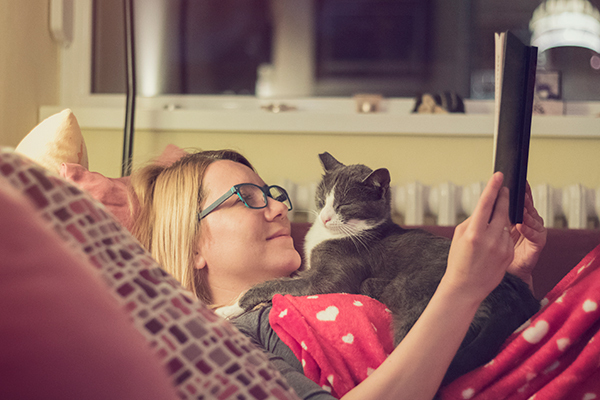 If your cat’s wheezing is caused by asthma, Dr. Gibbons says you can take steps to reduce allergens and irritants in your living space by introducing HEPA filters and frequently dusting and cleaning. 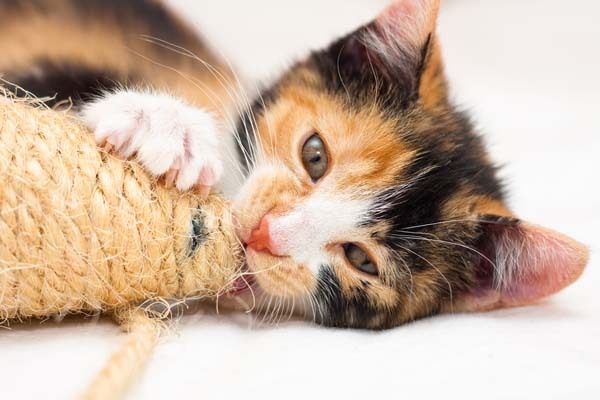 “Switching to a dust-free litter can also reduce episodes of coughing and wheezing for some cats,” Dr. Gibbons advises. A cat who is coughing, or a cat who is wheezing and coughing, should also see a vet. Gabby makes another strange noise that my other cat, Merritt, does not. This noise doesn’t sound the same as that painful cat wheezing, but more of an annoyed snort. We’ve dubbed this the “hufflepuff” (though I’m not sure Gabby would be sorted into that Harry Potter house), since it sounds like a short huff or puff of air coming out of his nose. It’s an annoyed, grumpy “hrumph” sort of noise that makes Gabby sound like an old-timey aristocrat who noticed an uninvited street urchin at his fancy dinner party. But, usually, he just makes this noise when I pick him up after I’ve caught him exploring our unfinished basement again. That being said, you should still pay attention to a cat who’s huffing, puffing, coughing, snorting — or making any sort of strange noise. “Snorting can be a sound of displeasure, but can also be associated with irritation to the nose and throat,” Dr. Gibbons says. As with most things, you know best when your cat is being a curmudgeon and when a serious health issue might be at play. And when in doubt, see a vet! I have an overweight Siamese mixed cat going on 12 years. He wheezes when he is sleeping soundly. Otherwise he seems healthy. Bright eyes. Moves like an old person.Eats both wet and dry food. Upchucks often, but not sure whether he eats too much or too often. Loves treats, and knows how to beg for them. One night I thought my husband was snoring as usual as he slept. I woke him up. It was not my husband, it was my siamese cat. Sadly after much testing and sadly it was large cell nasal carcinoma. We opted to try and save our precious boy and went the whole nine yards. We did stereotactic radiation which upon looking back should have been two treatments, not one, as they burnt his nasal turbines, followed by six months of chemo. He came thru it all. In a checkup too soon, and with his defenses down to zero , his city vet opted to scan his liver and though nothing was found, he was too long under anesthesia, an extra few minutes can cause a life to a cat in this condition. He caught an infection and could not fight it off. We also found out he was the first cat ever treated for this condition with sr and were told this later. Had we known we would have opted to take him to a more experienced institution and not had him be their first victim. We were never told this prior. He died as a result of the infection. This was at a large animal medical center in. Ny and always felt angered at their not being up front in the first place. While it cost us a fortune, we lost a precious life we would have done anything to save. I always felt their lack of a track record which we were never advised afbout contributed greatly to his death. He was cancer free following his chemo treatments which were done elsewhere. My cat was just diagnosed with asthma. He is on steroids and a bronchodilator. I only hear him wheeze when he is purring and it resolves quickly. I have taken him to the emergency hospital several times and he is always ok. The poor thing is so traumatized from all these trips to the vet. He sees his regular vet in 2 days and I will get her advice on what I should do. My cat does the weezing (just like in the video) but only in the summer time. Every Summer it starts up and stops in the late fall and winter. Very just gave antibiotics but didn’t help. Was thinking might do with the humidity but what do I know. Seems a inhaler and steroids might be something to try. Are vet seems to be out of ideas. My cat has asthma. Wheezzes about every couple weeks but recovers and is good for a while. Doc said we may need to get steroids to help but has not gotten to bad to do that yet. I have two cats. Sedgewick Oliver is a chocolate point Siamese and phoebe le bebe is a all white domestic short hair with pink paws and markings. He is 11 and she is 9. Her first trip to the vet was 6 months ago for the wheezing and they gave e capsules to break into her food..She will just walk away.. wont eat at all…She doesn’t puke at all never has because she gets petromalt daily which she loves. I don’t know what to do anymore about the wheezing ….been back to the vet 3x now…any suggestions They are both like my kids..
My 4 year-old, silver Egyptian Mau makes almost constant very soft wheezing, whistling or snoring sounds. They are fairly quiet although they are a little more pronounced just after active play (when he’s breathing a bit harder. -My spouse often makes similar noises when sleeping). I’ve had him to the vet who didn’t notice anything in the breathing but was willing to do “diagnostic tests”. My cat does not appear in any distress and none of his other behavior has changed. Should I be concerned and invest in the testing? We suggest going with a professional medical opinion on this one. Best of luck and hope your kitty feels better! My 12 year old cat doesn’t wheeze. I have a different question if you can please help me with. She all of a sudden stopped eating her wet food no matter what kind I put out for her. She is still eating the dry food and “CRUNCHES’. Any suggestions? I already tried that Hills cat food that is supposed to get her back to wet food again. It is $2.40 for a small can . . . And she just looked at it and walked away. $2.40 down the drain! Hi Ronald — Thanks for reaching out! We would contact your vet for the best course of action. Best of luck to you and your kitty!